Bluefox MKV to X Video Converter is a powerful MKV converter tool for converting MKV file to other video formats with excellent quality, such as MKV to MPEG, MKV to AVI, MKV to MOV, MKV to MP4 and MKV to WMV etc. And it can convert MKV movie to your portable devices, such as MKV to iPod, MKV to iPhone, MKV to PSP or MKV to zune. With a well-designed interface, Bluefox MKV to X Converter can help you convert MKV files to almost all kinds of popular video, including DivX, XviD, WMV, 3GP, AVI, MP4, M4V, ASF, MOV, VOB and MPEG. It offers some parameters of conversion options that you can be set, for example the frame rate, bit rate etc. 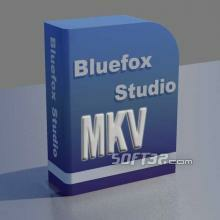 Overall, Bluefox MKV to X Converter is a great application with variable settings and fast converting speed. Free download MKV to X Video Converter that will give you a colorful life. 1.Convert MKV video to all popular video formats: Supports converting MKV video file to so comprehensive popular video formats like DivX, XviD, WMV, 3GP, AVI, MP4, M4V, ASF, MOV, VOB and MPEG, perfect support H.264 format. 2.Perfect solution of 16:9 4:3 video convert, Bluefox MKV to X Converter offer a perfect solution of convert MKV video between different video scale whether wide screen movie 16:9 to normal screen movie 4:3 or 4:3 to 16:9. You were offered 7 options for choosing. And no matter MKV to MOV, MKV to AVI, MKV to MPEG etc. 3.Excellent output quality by parameters optimized. The default setting can get good quality video, and you also can set them flexibly to get excellent quality video files. 5.Batch conversion, you can enactment every MKV video converting task flexibly, and the task can be saved and load. Safari 5.1.7 Safari offers you a superior Web experience.